Wake up to the morning sun in this large and bright two-room suite overlooking the English gardens. Located on the second floor of the Main house, the suite features a queen sleigh bed and matching armoire, cable television and airy yellow and red accents. 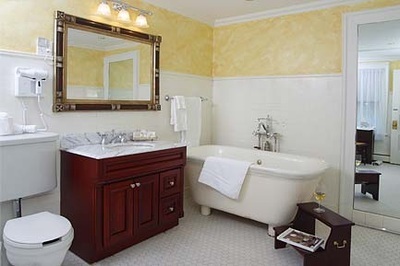 An old-fashioned soaking tub, large (separate) rainforest shower, and a mahogany vanity grace the large private bath. The living room offers a roomy couch and space to sit back and relax.